The perfect post-Easter chocolate remedy for kids’ health and parents’ pockets, Kids in the Park school holiday activities will be on at Sydney Olympic Park EVERY DAY of the school holidays from 13-28 April 2013 (inclusive). Starting at the Education Centre at Bicentennial Park, twice-daily at 11.00am and 1.00pm from 15-19 and 22-26 April (excluding ANZAC Day), the fun-loving characters of Circus Solarus will take kids on A Very Birdy Journey – a Trip with the Parkland Animals. After transforming into birds, bats or frogs, participants of the FREE activity will hear the animals’ stories and be guided by the larger-than-life creatures they will meet along the way of the entertaining performance tour. Kids in the Park will also celebrate 25 years of bird-watching at Bicentennial Park with 25 Twitch – a good-value activity at only $5 per child. Armed with binoculars and a check-list of 25 of the Park’s most popular feathered residents, Kids in the Park will give-flight to Sydney’s newest generation of bird twitchers from 9.00am-10.30am on Friday 19 April. For ‘wheely’ good fun, the FREE 25th Anniversary Chase bike-race is sure to amuse from 9.30am-4.30pm every day of the holidays. 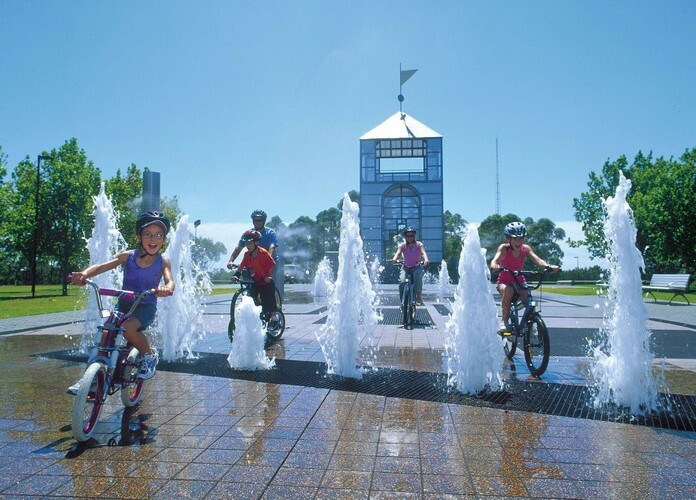 Using their own bikes or ones hired from the Bike Hire Shop at Bicentennial Park, children aged 7-14 can participate solo or as a team as they use a map to find 25 of the most special spots and artworks within the iconic Park. From making tracks to NEW Pizza and Pasta Making at Lilies for little-ones aged 2-5 years, Bicentennial Park will be buzzing with school holiday entertainment this April! The hour-long interactive cooking session from noon on Friday 19 and 26 April will see junior master-chefs make pasta-crafts and mini pizzas for lunch for only $19 per child. Mamma Mia! Emerging Einsteins will also be blown-away this April by the Kids in the Park debut of four Fizzics Education science workshops at the Education Centre at Bicentennial Park. On 18 April, Fizzics Education – Lego Robotics from 10.00am-1.00pm will expose the inner-workings of robots using NXT Lego Mindstorms robots and other cool technologies. From 2.00pm on the same day (18 April) and for the same $35 cost per participant, the Newtonian principles behind rocketry and space-survival will also be revealed during Fizzics Education – Riproaring Rockets and Space. On 23 April, kids will get to hold real fossils and simulate dinosaur digs during Fizzics Education. From science to the arts, creative kids will also get to while away the hours at Sydney Olympic Park this April with FREE daily-entry to ARTEXPRESS at the Armory 2013 and four FREE art workshops at the Armory Gallery on 16 and 23 April. Add to the line-up the NEW Lodge ‘Super Safari’ Holiday Camp for ages 5-12 to explore the great outdoors as well as their creativity, NEW Riding the Rails on-board the popular Heritage Train every Sunday for only $5 per passenger, Sydney Olympic Park’s super-cool Urban Jungle Adventure Park, Flying Trapeze and Circus Skills, Writing Workshops, Digital Filmmaking, Clue Trails and virtually every sport under the sun… it is little wonder Kids in the Park makes Sydney Olympic Park the official home of the BIGGEST range of school holidays activities of any location in NSW! For more information about the Kids in the Park April 2013 program of more than 50 school holiday activities – including 18 FREE and 12 good-value options at $20 or less per person – visit kidsinthepark.com.au or call 02 9714 7888.